Home » Personal Finance » How to check UAN (Universal Account Number) Online? Soon you will get your UAN Number (Universal Account number) for PF account. This UAN number will be unique throughout your career. Prime Minister Narendra Modi is expected to launch Universal Account Number (UAN) website on 16th Oct. This will enable PF portability. Right now every time you are joining new company, new PF number is given and you need to transfer your fund from old PF account to new account. After getting UAN, a PF subscriber would not be issued a new account number on joining a new firm. Under this initiative each PF subscriber will be given UAN (Universal account number) linked with PF account. 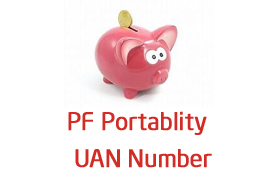 So if you are changing Job UAN number will be enough to move your funds in PF. This will make PF account portable. This is welcome step for all employee and will smooth line transfer of PF money. PF Subscriber (Employees) will also give personalized login on website through which you can view transfer claims and update KYC information. How to check UAN Number Online? You can check it up with your employer they must have got UAN number list from EPFO now. If your employer is not in position to give you status of UAN number don’t worry. You can check the UAN status online from the EPFO portal. On clicking Know your UAN status link you will be redirected to page where you need to give your PF account details. Select State and PF office. If UAN number is not allocated you will get message “UAN is not allotted”. Alternatively if you are registered with epfo with mobile number you will get SMS containing following message. Once you obtain UAN number you need to activate this number by logging to http://uanmembers.epfoservices.in/ and clicking on “Activate your UAN based registration”. You will be redirected to page where you need to enter UAN number, Mobile number and PF details. Once you give this details you need to click on GET PIN. System will send PIN on your mobile. By entering valid PIN and details your UAN will be activated. If you have yet not got UAN number, kindly contact your HR to get UAN details. « Wake up call – If you are still poor at 35! Both old and new UAN portal are not working and is crap, government has not fixed this and need to fix this soon as this is delaying PF withdrawal. This is creating problems for public. The new UAN link https://unifiedportal-mem.epfindia.gov.in/memberinterface/ is always saying connection time out. There is always timeout issue and customer care no is always busy, why it’s so ? Is there any alternate method of linking EPF N. and UAN ?